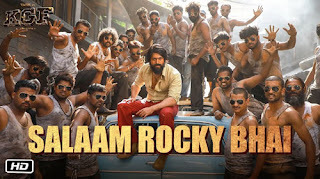 Salaam Rocky Bhai Lyrics from the new movie KGF Chapter 1. This song is sung by sung by Vijay Prakash, Mohan Krishna, Santhosh Venky and others. Salaam Rocky Bhai Lyrics – KGF Chapter 1: Presenting Hindi Version of this Kannad movie song which is sung by Vijay Prakash, Mohan Krishna, Santhosh Venky and others. Its music is given by Ravi Basrur and lyrics are written by Nagendra Prasad.